– The wind direction indicator fell off the mast, maybe because a bird landed on it? We’ll install a replacement. – When this wind indicator disappeared, then we relied on the anemometer to show us the wind direction and speed. But its display has a failed light so we could not see it during nighttime sailing. We need to either fix this light problem, and/or install a redundant anemometer because this trip made us realize how important it is to know the wind direction and speed in unsettled weather. – The Monitor wind vane control lines gave us tons of problems the whole passage. We must figure out a better system so we don’t need to hand steer so much of the time on the next passage. The Neco autopilot gave us no problems, other than gobbling power so we couldn’t use it for long periods. Maybe better power generation, or more robust batteries are required. – We found ball bearings on the deck – a block must of failed. We have yet to figure out where they came from, which is not reassuring. – The first reef block on the boom is squeaking and the sheaves on both reefing blocks are a mess. We’re getting both reef blocks rebuilt at Zephyrwerks. – The gooseneck on the boom almost had a pin fall out, nearly allowing the boom to separate from the mast. We are replacing the pin with a bolt, nut and loctite. – The outhaul on the main boom failed, and needs to be rebuilt. We brought the boom to our house at the end of the passage to do that. – The Genoa foot tape stitching failed due to UV exposure. We need to sew the foot tape back on. – The brand new mizzen sail has some chafe from where we tied the furled sail to a shroud. We need to repair these small holes before they get bigger, and never secure it that way again. – The mizzen cover was chafed through when the mizzen sail was chaffed, and the main cover is just old, so both covers need to be replaced. – The cockpit canvas zipper on the port side failed, allowing boarding waves to flow into the helm area where there are connectors that are not waterproof. We need to both replace the zipper and waterproof the helm-area connectors. – The floorboard under the helmsman seat is rotting, so the seat fitting came out. We need to repair the rotten wood and design a better seat fitting method that won’t be a toe breaker like the current one. – The Lavac toilet seat hinges kept slipping, allowing the toilet seat to fall off. Very, very annoying when the boat is pitching. We need to improve how these hinges are held in place. – The head pump clogged on the 2nd day of the passage. We tore it apart to unclog it, but its probably a jolly idea to rebuild the pump before we set off again. – At least 3 portlights are leaking. We need to rebed them all (except maybe the 1 that we did a few season ago). – The potable water began tasting of mildew after we used the hot water system to take a shower. We plan to rip out the propane instant hot water and hot water plumbing. We’ll just use a tea kettle to make hot water when needed. – The one handhold on the cockpit hard dodger failed. We need more handholds in the cockpit to make it easier to move in rough seas. – The PO ran the solar panel wires through scuppers and out through the sidewall below deck. He gooped up these penetrations but after decades that goop failed, which meant the aft bunk got rather wet with each boarding wave. We need to reroute the solar panel wires through deck fittings and glass over the holes in the scuppers. – The house batteries were overly discharged due to the failed solar charger, and so we need to replace them. They were 6 years old so at least we got good use before killing them. – We need to improve the ventilation in the battery box – it gets very hot inside the box when we run the engine now that the sea water temperature is in the 80’s rather than the 50’s. An alternative is to replace the house batteries with ones that are not so temperature sensitive. – The anchor roller wore away because we left the anchor riding on it. It was secured and not much weight on the roller, but traveling 3400 NM is a long time for an anchor to wiggle on the roller. We need to find a place to store our large Manson Supreme anchor while at sea. That’s it, according to my notes. Not bad for an old boat making such a long rough crossing. 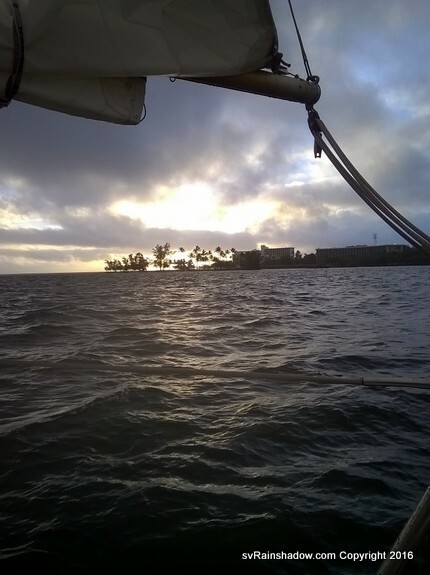 So Rainshadow is currently undergoing a refit in Hilo Bay. Besides these needed repairs, we have other improvements on our wishlist, such as rebedding everything that penetrates the deck, adding a day water tank… the list goes on and on. As always, we’ll prioritize so we can set off again before we are too old and stiff to set sail ever again. We don’t seem to be aging as well as Rainshadow. Our excuse is that we are older than she is.